Fresh turmeric root fights inflammation and contains antioxidants. 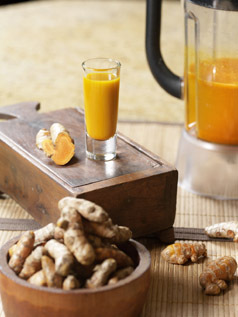 The best way to enjoy fresh turmeric is to juice it. Once juiced and strained, it can be stored in a tightly closed container in the refrigerator for up to a week. Once juiced and strained, it can be used in Grace’s Turmeric Rice and Turkey in Turmeric Sauce. 1. Slice the turmeric root until it measures about 1 cup. 2. Place the turmeric slices in a food processor or blender. Add a bit of the water and blend at low speed. Gradually increase speed, slowly adding water until all of the water is used up and mixture is smooth. 3. Strain the juice using a fine-mesh strainer, cheesecloth, or coffee filter.